“My Cutey’s Due at Two-to-Two Today.” Music by Albert Von Tilzer, lyrics by Leo Robin (1926). 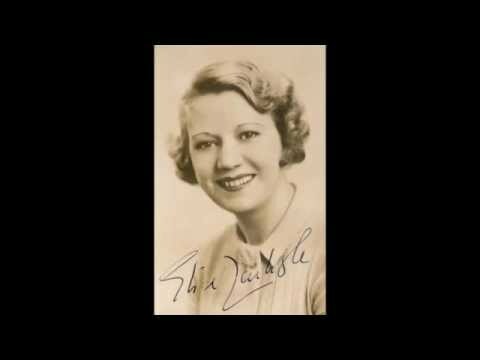 Recorded by Elsie Carlisle with piano and vocal accompaniment by Carroll Gibbons in London on October 6, 1926. Zonophone 2815. Von Tilzer and Robin’s “My Cutey’s Due at Two-to-Two Today,” an example of the “train song” genre, is a light composition that makes up for a fundamental lack of profundity by being ridiculously catchy, almost addictive. It speaks primarily of faithfulness in one’s lover’s absence and of the giddy anticipation of reunion. Elsie Carlisle brings to it the requisite frantic, girlish enthusiasm and applies her vaguely conversational style of delivery to the song’s rhythmical patter with great effectiveness. She is accompanied on this record, not only by Carroll Gibbon’s piano playing, but also by his voice; he engages in a muted antiphony with Elsie for part of the song. “My Cutey’s Due” was recorded in America in 1926 by Sam Lanin and His Orchestra (as the Missouri Jazz Band), Ted Weems (Park Gibbs, vocalist), the Happiness Boys (Billy Jones and Ernest Hare), The Clevelanders (with vocals by Tom Stacks), and the Little Ramblers (with vocalist Ed Kirkeby). In Britain there were 1926 versions by Bert Firman’s Dance Orchestra, Don Parker and His Band, Victor Sterling and His Band, Van Straten and His Riviera Dance Orchestra (with vocals by Harry Fay). In early 1927 there were recordings made by Alfredo’s Band and by the Picadilly Revels Band.